Like its parent club in the NHL, the Manitoba Moose have been struggling to win games. Currently the team sits 24th in points percentage. What separates the two teams is why they have been losing. There is a primary cause for the Moose struggles and it may suggest a larger issue within the Winnipeg Jets’ organization. Unlike the Winnipeg Jets, the largest struggle for the Moose has not come from between the pipes. Eric Comrie played well for the first quarter of the season, and started to struggle afterwards. Luckily for the team Ondrej Pavelec, who was not doing well at the start, picked up as soon as Comrie started to falter. Overall the two netminders have stopped about 91.1 per cent of shots, a fairly average save percentage for most AHL seasons and slightly above for the 2016-17 season. While Jack Roslovic and Dan DeSalvo have not been dominating the league, they are decent point scorers. 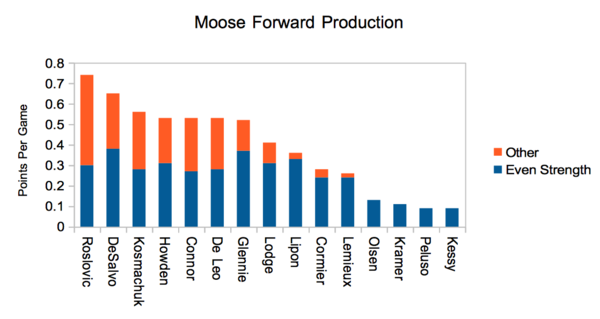 In addition to the teams two top producers, the Moose have a ton of scoring depth, especially at even strength. The team has produced decent shot totals, and these are mostly coming from the front-end. So, with average goaltending and all that young talent, why are the Moose struggling? The team sits 27th in estimated Fenwick Close at 46.95 per cent. 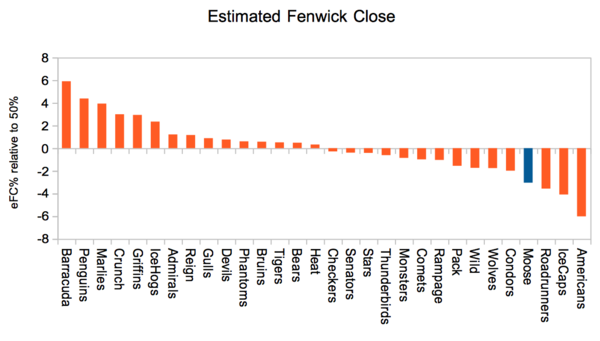 Long before we had the advancements of models like expected goals or even score-adjusted Corsi in the NHL, Fenwick-close was the best predictive model publicly available for NHL analysis. Fewnick Close simply looks at a team’s share of 5v5 unblocked shots when the score is within 2 goals for the first two periods or tied in the third. Now that information is not publicly attainable for the AHL, but taking the team’s shot differential for the first two periods does give a decent approximation. The team is outshot consistently, with only controlling 47.93 per cent of shots on net. The team is 12th in shot volume generation but 28th in shot suppression. 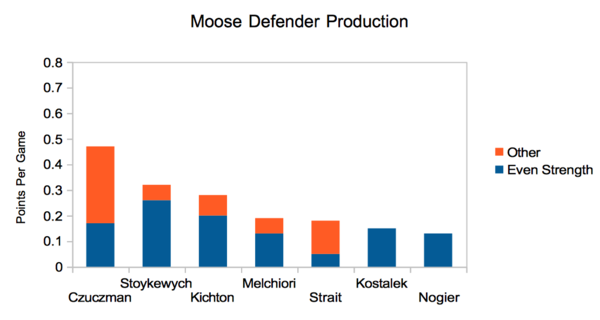 The Manitoba Moose have an absence of solid puck moving defenders. Brenden Kichton can move the puck decently at the AHL level with his passing and local boy Peter Stoykewych has been getting slightly better in this regard. Overall the team is severely lacking in quick, smart, and agile puck moving defenders. For the most part the team’s defenders are big bodies that can skate relatively well for their size, but they rarely score and can’t handle the puck. This profile may sound familiar, because it sure did for me. It sounds like the profile for nearly every defender the Jets 2.0 has drafted. Above you will find every defender drafted by the Winnipeg Jets. I have (slightly subjectively) given them check marks in three fields. The first category is height. I chose 6 feet tall, although feel free to shift the checkmarks in your mind to the NHL average for defenders: 6’1. 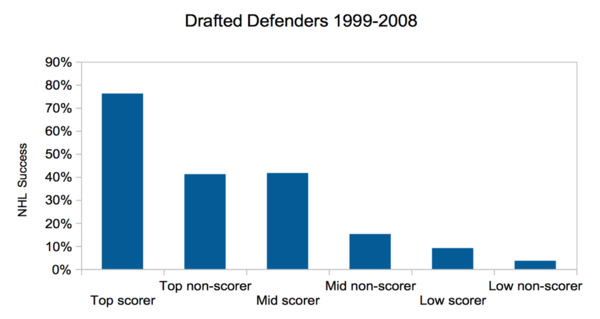 The average drafted defender by the Jets is 6’3.3 and the median is 6’4, both over the NHL average for a defender. Overall the Jets have valued height greater than the average NHL defender size. As a fun note: Breden Kichton, Josh Morrissey, and Tobias Enstrom are the only sub 6′ tall drafted defenders in Atlanta-Winnipeg franchise history. Now skating is fairly subjective but almost all of the Jets defenders were noted for their skating at the draft. The only one exception I could see arguing is recent pick Logan Stanley, which would depend on your definition. Stanley doesn’t have the four-way mobility of Luke Green or Josh Morrissey, but he was noted for huge improvements in his speed over his draft year and for being far better skater than expected given for his height at the end of his draft season. The above graph splits CHL drafted defenders into three bins based off of draft position (Top: 1st round, Mid: 2nd round, Low: 3rd+ rounds), and then split those three bins each into two based off of draft season scoring (Scorer: >=0.6 pts/gp, Non-scorer: < 0.6 pts/gp). The above shows two things. It shows that scouts do detect value in defenders aside from scoring that makes them successful (although at least some of this could be due to amateur scouting bias also extending to those that decide who makes the teams). It also shows that scouts undervalue scoring in relation to how likely a player will be successful. 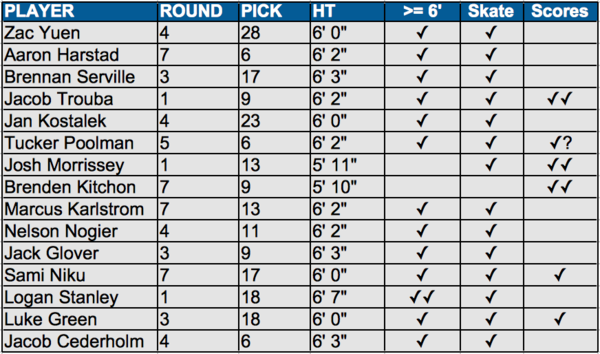 The Jets have drafted some players who would be considered in (or very close to) the “scorer” bins above. Josh Morrissey and Jacob Trouba were excellent scorers in amateur level relative to their age and league. Sami Niku has been a solid scorer in European Men’s leagues. Luke Green has been one of the top even strength scorers in the the QMJHL for the past few seasons. Tucker Poolman was an excellent scorer, although the question mark is due to the uncertainty with him being a relatively older draft pick. Whenever I mention the Jets defensive prospects and their lack of scoring, Kichton is often used as an example or argument against. He was an impressive scorer in junior but looks to peak in the AHL. However, one needs to take things into perspective. Kichton was a seventh round draft pick that put up 118 points in the AHL and was once nominated to the AHL All-Star game. Now look at all of the Jets 3rd+ round draft picks in the same year or prior to Kichton: Zach Yuen, Brennen Serville, Jan Kostalek, and Marcus Karlstrom. Three of these defenders did not receive entry level contracts. The one who did, Kostalek, has been struggling in his second year of professional hockey. Kichton meanwhile earned his second contract with the Jets. The Moose have been struggling to win games, despite average goaltending and a forward group capable of producing shots and scoring in the off-chance that they are in the offensive zone. The team has been unable to transition the puck out of the defensive zone due to a severe lack of plus-level puck moving defenders, and this problem may have extended due to the team overvaluing big, skating defensemen who cannot handle the puck. The good news is that this should not be too hard to fix. The organization just needs to adjust their scouting values somewhat and then add some free agents over the summer to potentially fill in the gaps. Thanks for this article Garret. It’s 100% in line with my observations / concerns, and hopefully it gets read by Chevy and the Jets’ scouting department so that perhaps they may become more enlightened in regards to how they assess and value draft eligible defensemen. I’ve been to 18 Moose games (12 last season and 6 so far this season) and my complaint from the start has always been that the team lacked and continues to lack mobile, puck moving defensemen (with the exception of course of Morrissey last season). As a result, the team is typically badly out shot and the skilled forwards (and goalies too for that matter) haven’t been given an optimal environment to develop and flourish. Hopefully Logan Stanley is the last defenseman that Chevy and the Jets’ scouts draft due to their bias of grossly overvaluing size over skill and offensive production.